While it is assumed that the stores with higher sales within the same retail category pay higher rent, is the correlation consistent and what can be done to create a win-win situation for the retailer and the landlord? Retail leases are evolving with some interesting twists. This paper examines a number of retail lease case studies and will discuss issues concerning retail leases and tenant sales. Since 1982, retail space has grown from 3.0 billion SF to 5.2 billion SF which is a 73% increase. Over the last 15 years, our national population has grown 16%. There are a growing number of co-ventures including McDonalds with Amoco and Wal-Mart, Simon malls and their tenants with a credit card operation, Office Depot with American Express, and the Chicago Cubs baseball team with Beanie Babies (while it was not as glamorous, it was more profitable than winning the world series!). Many retail landlords have less than the maximum amount of debt on their properties in todays market. In addition, more properties are owned by REITs which also have low levels of debt and have the mentality that their centers will be able to achieve high sales. If you were the retail tenant, which of the following three lease options would you select? If you were the landlord, which lease option would you select? Option A: Base rent of $20/SF plus 5% of sales over $300/SF. Option B: Base rent of $16/SF plus 6% of sales over $240/SF. Option C: Base rent of $0/SF and 7% of total sales. This has been answered with the obviously, clear solution "that it depends on projected sales". If projected tenant sales are above $340/SF, the tenant pays less rent with Option A. And most retail landlords would also select Option A. This obvious answer is being re-examined by retailers and landlords in todays market. And the historically obvious answer is now wrong! This is not only changing for the retail tenant but also for the landlord. Retailers prefer the lower risk, lower rent during the initial opening 1-2 years, and if sales are strong, there is ample profit available from this location to pay for the slight increase in rent. Landlords are able to attract tenants easier and can benefit from their efforts to have attractive, well-located developments by receiving a greater return through higher percentage rent and a lower base rent. This paper will examine a minor but growing trend of retail landlords and tenants that are electing the option of a lower base rent with slightly higher percentage rent terms. This is not the majority of retail leases and will not apply to the majority of the retail leasing situations that currently exist but it is an interesting option for landlords and for retailers in many situations. Historically, leases with realistic sales breakpoints and significant percentage rent potential were offered on a short-term basis to tenants that were not convinced of the location. This has changed for a handful of national retail tenants and retail landlords. Some retailers are requesting a percentage-rent only lease option and are exercising this option. These tenants had been previously characterized by retailers such as Barbs Corkscrew Willow Crafts or Tonis Tasty Lip Glosses, but now percentage-rent only tenants include Sears, McDonalds, and Old Navy. With the increasing number of affiliations or co-ventures that are occurring, those that are writing a lease as a partnership or team effort between the landlord and the tenant offer an innovative alternative. If the landlord does a great job with the center, the tenant will have strong sales and will be able to pay higher rent with their even higher store profits. The concept to maximize the highest rent that the tenant can afford and to minimize the vacancy rate is being re-visited by landlords and by tenants. Loans do not get foreclosed in the first 2-4 years. The past emphasis of lenders on only base-rent (also called minimum rent) is shortsighted and has not worked. Charging high base rents that are not affordable and that are not paid by a retail tenant is simply bad business that hurts both the landlord and the tenant. The advantage of a lease that stresses percentage rent results in the tenant paying more rent when sales are up and results in less vacancies when sales are down. The disadvantages of leases with a greater weight on percentage rent include setting the percentage rent terms and evicting tenants with low sales. No two retail centers are the same. How can landlords and tenants mutually agree to a rental rate that will be fair over the next 10-20 years for a given location with retail rents in say Chicago ranging from $2-3/SF in some locations to over $250/SF on North Michigan Avenue. Add in the time factor with rental rates that have been swinging over and under inflation. The historical retail lease with a fixed amount, pre-set rent bumps, and a sales breakpoint that is seldom reached, has major problems. If the tenant sales are flat, the tenants rent as a percentage of sales goes up and may hurt the financial viability of the tenant. If the tenant sales skyrocket, the tenant would be able to pay more rent based on their profitability but the landlord does not receive any financial reward for achieving a successful tenant-mix and maintaining a quality property. Setting lease rates without consideration to whether the tenant sales can support this rent is a wishful prayer (often without upside potential incentives for the landlord to do a great job). Leases with rental rate escalations based on changes in CPI account for inflation but lose incentive for the landlord and the tenant to operate that specific location to maximize their mutual financial returns. Why write a lease with a base rent that is say $20/SF that equates to 10% of the tenants sales and have a breakpoint of 6%? If the tenant can only afford rental expenses of 6%, how can the tenant afford the base rent? When the rent increases are derived from tenants sales, rent increases are a function of that stores location and the center. And this makes sense to the landlord and to the tenant. Does this apply only to national tenants? No. Government data indicates that the majority of business failures in retail occur in the first four years and hence maybe the high fixed rent was part of the financial problems. Market acceptance can take several years for certain types of retailers and having less rent in the beginning might allow the startup firm to pay higher rent over the long term. It is in the interest of the landlord and the tenant to negotiate a lower minimum rent with a higher percentage rent to minimize costs in the startup period. In this paper, the term "rent" excludes CAM and real estate tax reimbursements and the term "occupancy cost" includes CAM, real estate taxes, and rent. While historically lenders have demanded and utilized base rental income, many lenders ended up foreclosing on shopping centers with retail tenants that did not pay this high base rent. The emphasis is now on the tenant sales. Regardless of the how high the base rent is, a retail development with high sales and tenants paying the rent is more likely to pay the mortgage than a largely vacant center. In the past, lenders preferred to not utilize projections for percentage rent and preferred simple base-rent only deals. This has changed as retail lenders have grown in their sophistication, have had to increase their due diligence in underwriting the retail tenants creditworthiness, and have had to understand the sales potential of the retail tenants. Along with the demand from borrowers continued push for larger loan amounts, lenders have become very good at underwriting loans utilizing percentage rent. While this initially involved a minor amount of percentage rent such as up to 10% of the base minimum rent, this stipulation has fallen with mortgages written on retail properties that have over 15% of their projected revenue from percentage rent. This requires "in-demand" retailers which have proven sales growth and established operations. Many landlords have less than the maximum amount of debt on their properties in todays market. This allows the landlords to offer a lease with lower base rent and higher percentage terms. In addition, more properties are owned by REITs which also have low levels of debt and have the mentality that their center will be able to achieve high sales. Hence, the REITs are able and willing to take on replacing higher guaranteed base rents with lower base rents with higher percentage rent terms. This produces greater rental income growth projections and sells a better story to shareholders. "Have I Got A Great Location For You!" As more retail space is developed as built-to-suit, there is a growing supply of vacant second-generation space. Developers often had very solid locations but the national retail tenant either went bankrupt or changed their store size resulting in the move to a new store. These developers feel their location and surrounding center will produce strong sales and the developer demands appropriate rent. The retailer may not be completely sold on the center, the impact of the "proposed renovation" and the potential tenant mix that the developer is currently trying to lease. Hence, a lower base rent with slightly higher percentage rent terms could meet the demands of both the landlord and the tenant. Some people have theorized that the level of the minimum rent verses percentage rent is a risk/reward trade-off. The theory is that higher base rent is less risky and has a lower return to the landlord. I disagree. Tenants with unrealistically high minimum rents compared to their sales end up paying no rent as the store closes. Tenants with growing sales are able to pay growing rents. Tenants with low sales are more likely to pay the lower percentage rent than pay a higher base rent. When the office market was overbuilt in the late 1980s and the first half of the 1990s, many tenants demanded, and many landlords offered, free rent in the beginning of the lease to attract tenants. The option of offering a lower base rent with higher percentage rent terms (Option B above) is similar to the free rent that was offered to office tenants as the initial rent is projected to be lower than the standard option (Option A above) with rents that are higher at the end of the lease term. When landlords are now writing leases with greater percentage rent including leases that are 100% percentage rent, the lease typically includes a penalty clause if the tenant ceases their operation. The penalty clauses are often very significant, up to $1 million. But the amount is often less than if the tenant had to continue paying a flat base rent over the remaining lease term. The penalty clause for early termination is acceptable to retailers as the retailer often does not want to have to be liable for a long string of rental payments if their plans change. The landlord requires the penalty clause to pay for tenant improvement allowances and leasing commissions. This also allows for increased security and reduced risk for lenders. Tenants with higher gross margins will generally have lower sales and have higher percentages in the percentage rent lease terms. For example, a discount department store might pay 2% with sales of $650/SF while a book store might pay 6% of sales with sales of $250/SF. As stores are offering some product lines or services with lower gross margins, their leases are allowing for these sales to segregate out from the total sales and are applicable to a lower percentage than the remaining sales. 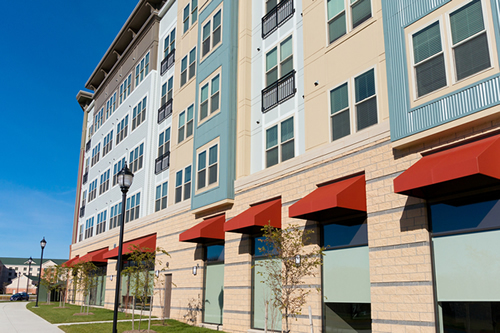 In most retail leases, the tenant is responsible for their share of CAM and real estate taxes. Landlords in increasing numbers are both involving tenants in major capital expenditure programs that benefit the entire center and are billing back the capital expenditures to the tenants over time including a finance charge. Recent examples include the installation of a signal light which cost over $350,000, new signage, and painting an adjacent water tower owned by the city with the retail centers name. The keys to getting tenants to pay is writing it into the lease that the retail center and the tenant will operate as a team along with communicating with the tenant. Jeffrey Kreshek, president of a property management firm, stated "The biggest compliant that I hear from tenants is not that items such as these are included in CAM charges, but that they were not consulted prior to the expense being incurred." One of the ways to protect the landlord in offering a lease option with lower base minimum rent and higher percentage is to include the landlords right to cancel the lease if total sales are below a specific amount in a given year. As noted above, the rent with tenant sales at $340/SF is the same with both Options paying $22/SF total rent (rent/revenue is 6.5%). The impact of Option A and Option B as stated above were prepared under two different tenant sale levels of $240/SF (possible start-up time) and $440/SF (possible established tenant). Option B with the lower base rent and the higher percentage pays lower rent when sales are low and higher rent when sales are high. This is obviously beneficial to the tenant. This might also be beneficial to the landlord if this allows the tenant to stay in business during a start-up period. We do not prescribe demanding major changes to all leases. Rather the small, but growing trend of offering an option of a lower base rent with a higher percentage rent can be beneficial to both the retailer and the landlord. It is interesting that in our work, we have both the retailer and the landlord making the marketing pitch for the Option B type of lease. In the landlords case, the landlord does not believe that retailer will pay the initial base rent that the center can deliver in terms of tenant sales. In the retailers case, the retailer wanted to pay less rent up-front and was willing to pay more rent if sales were high. While we operated only with antidotal data, we tried to address the question if an Option B type of lease would lead to less vacancies. Due to the lack of data currently, we can only state that these types of leases are generally given to tenants that are "hot" and the tenant leases that we were given are still going strong. We did receive comments regarding more long-term actions and the benefits of having the same retailer in the same location for many years. The landlord has increased incentives for cross-shopping, improving access and visibility, negotiating with the city for better signage, creating entertaining holiday programs, and organizing public relations at a charity fund-raiser. The retailer prefers the lower up-front rent, less risky position, and when their sales are high, the retailer is willing to reward the landlord for being a great team member in their success. The profitability of a retail tenants store location is a direct function of their sales. The tenants capacity to pay rent for a specific location is a direct function of their sales. Lowering the base rent and increasing the percentage rent ties rent closer to sales for the vast number of leases that do not reach their sales breakpoint (estimated as high as 96% for the nations largest retail landlord). The worth of a retail center is a function of its ability to derive tenant sales. Landlords can and do assist in making an individual retail store location a financial success from signage, promotions, valet parking, attractive landscaping, etc.. Tying rent closer to tenant sales provides financial incentives for the landlord to maximize each tenants sales. This also includes fewer vacancies with lower rent to keep tenants that would otherwise vacate. Tying rent closer to tenant sales also lessens the risk of inflation by having increased total rents faster with lower sale breakpoints and higher percentages. In discussing this concept of lowering the base rent and increasing the percentage rent per the above example, it is interesting to note that a retailer stated that it would be a way to "save money" and a landlord stated that it would be a way to "maximize returns". Hence, it offers a win-win situation from both the retailer who wants to save money up-front and the landlord who strongly believes that their center will produce high tenant sales. The overwhelming conclusion that was derived was the concept of the landlord and the tenant working together in an Option B type lease, both striving for higher tenant sales, and both being rewarded with financial incentives, spoke very loudly. An example given was a very large REIT (landlord) that offered to secure a great tenant if the remaining tenants all lowered their breakpoints. The landlord got the tenant with a low base rent and slightly higher percentage rent. In addition, each of the other tenants agreed to lower their sales breakpoints. While percentage rent is less than 5% of the total rent currently, this is likely to increase slowly as tenants and landlords strive towards incentive-driven leases that emphasis greater percentage rent. Favorite quote from this research was "Landlords arent doing this to save the world and try out for Sainthood."